Stefan Tegenfalk’s Anger Mode gets off to a dramatic and shocking start, setting the pace for the next 430 pages. A judge coming home from a meeting brutally murders a taxi driver; previously of good demeanour, the judge seems like unlikely murderer. He’s admitting the crime, but can’t explain why he did it. Jaded (aren’t they always?) Detective Inspector Walter Grohn is charged with investigating the case, assigned to him is Jonna de Brugge, a rookie with the Swedish Investigations Unit. Two more equally horrific yet unexplainable murders follow, each one involving an employee of the Swedish judicial system. SAPO, Sweden’s Security Police become interested in the murders and Walter and Jonna are effectively bumped off the case. The right wing leader of SAPO, Martin Borg, believes that Islamic elements, who wish to see Sharia law established in Sweden and therefore want to target the Swedish judicial system, are connected to the case; Walter is not convinced. While all of this is going on, Walter is diagnosed with a brain tumour though he refuses to be sidelined through medical reasons as much as any other. Against the young woman’s better judgement, he persuades Jonna to launch a separate, secret investigation which he coordinates from his hospital bed. It will pay to leave any doubts at the door; there’s no denying that Anger Mode pivots on an improbable scenario. The outcome is also telegraphed early on though the route to that conclusion follows a complex and thrilling series of turns, more than enough to satisfy the most demanding of readers. Throw in a an ambitious journalist desperate to prove himself in his profession, a SWAT team leader who likes to do things his own way and a power struggle between the various arms of the Swedish law enforcement system and you have a richly layered story that keeps those pages turning. Although I found the plot hugely entertaining and absorbing, I can’t say I found the main characters particularly engaging. 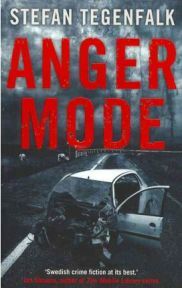 Anger Mode is intended to be the first of a trilogy (to my irritation I discovered this after I’d been infuriated by the ending) and it’s only a desire to know what happens to the perpetrator rather than a connection with or an interest in Walter and Jonna that will have me reaching for the next instalment. It’s not that the characters aren’t believable, more that they are unoriginal and a bit one dimensional. There is however, an interesting aspect to their working relationship as you see Jonna change from the hard headed know it all rookie to a willing pupil, appreciative of what Walter can teach her. More thriller than conventional police procedural, ‘Anger Mode gallops along at a breath-taking speed. However, this is pretty tidy work and there are no superfluous characters to complicate matters. The dialogue is punchy and believable and, to some extent, helps to distract from the far fetched plot. The translation reads well but there is too much focus on the various departments of the Swedish judicial system and how they do – or, more accurately, don’t – work together and this is an unnecessary element that could easily have been edited out for the English/American market. If you can ignore the largely implausible premise that the story hangs on then this is an extremely readable novel that happily doesn’t really suffer for the bland lead characters. There’s enough excitement here to fill a whole bookshelf. I’ll definitely be back to find out what happens next. No Comments on "Anger Mode"